Russian speaking Jews constitute about 20% of Israel's total population today. Notwithstanding their large numbers, the fact that they have been calling Israel their home for quite a few decades by now, and that especially many of the younger generations perceive of themselves as Israelis, the veteran Israeli population still refers to them as "Russians", suggesting that they are a homogeneous whole. Negative stereotypes of Russian speaking Jews also still persist, and racist portrayals of Russians as alcoholics, gangsters and prostitutes are quite common place, including in Israeli media. Also children and young people of Russian background complain about discrimination and racism by their peers and teachers. More recently the community is commonly associated with the extreme political right, and as such is being depicted as an obstacle to peace in the region. Many Russian speaking Jews in Israel thus feel that after having suffered for being Jewish in the Soviet Union, today they suffer for being Russian in Israel. Ironically, at the same time Russian speaking communities are often accused of isolation, and of not being willing to integrate themselves. Instead, it is argued, they refuse to learn Hebrew, retain their distinct culture(s) and thereby create "Russian ghettos" in their neighbourhoods, a notion which is especially worrisome to those Jewish Israelis who still believe in the Zionist goal of creating a unilingual and unicultural Jewish society in the homeland. Mass immigration from the former Soviet Union started in 1989, and within only one decade it is estimated that more than a million Russian speaking immigrants arrived in Israel. For many, the decision to leave their home country and migrate to Israel constituted a purely pragmatic one, motivated primarily by so called "push factors", such as the economic crises, the political instability, and the growing nationalism and anti-Semitism in post-Soviet Russia, rather than "pull factors", such as a positive identification with Judaism, Zionism or Israel. In fact a lot of the Russian speaking Jews would have reportedly preferred to migrate to the US, yet Israel successfully pressured the government to deny Soviet Jews refugee status, and thereby facilitated their mass immigration to Israel. In the beginning the new immigrants were welcomed rather enthusiastically; especially veteran Ashkenazi Jews regarded them as "safeguards against the alarming rise of the Mizrahi and Arab populations" and as "bulwarks of the endangered Ashkenazi-Western culture". This however changed soon, especially when it became apparent that approximately half of the migrants were not Jewish according to Halakhic law, which only recognises those people as Jews, who were either born to a Jewish mother, or who undergo Orthodox conversion. According to Israel's Law of Return, however, anyone with a Jewish grandparent, or anyone married to a Jewish spouse, is eligible for Israeli citizenship. Yet in a state where Jewish Orthodoxy still holds the monopoly on administering the right to marriage and burial, those Russian speaking Jews who do not qualify as Jews under the Halakha, are obviously less welcome, at least by the more religious section of society. In addition to that, due to the harsh repression of Jewishness by the Soviet regime, the great majority of the Russian speaking immigrants only had a vague notion of Judaism and of what, according to Israeli Jews, constituted Jewish culture. The integration process of Russian speaking Jews was further complicated by the few economic opportunities that the small Israeli state provided for them. Over 60% of the new immigrants brought with them academic degrees, yet the job market in Israel was too small to absorb all of them. In addition many Russian speakers lacked technical or language skills and so many of them eventually had to face a downgrade in their occupational and economic status. Particularly women, many of who had been trained in the Soviet Union in domains considered to be "non-feminine" in Israel, such as engineering and technology, faced problems in finding employment in their professions. All those difficulties considerably increased the feeling that they were not wanted in their new home country and contributed to what the veteran community refers to as "the self-isolation" of the Russian community and its reliance on a growing ethnic subculture. 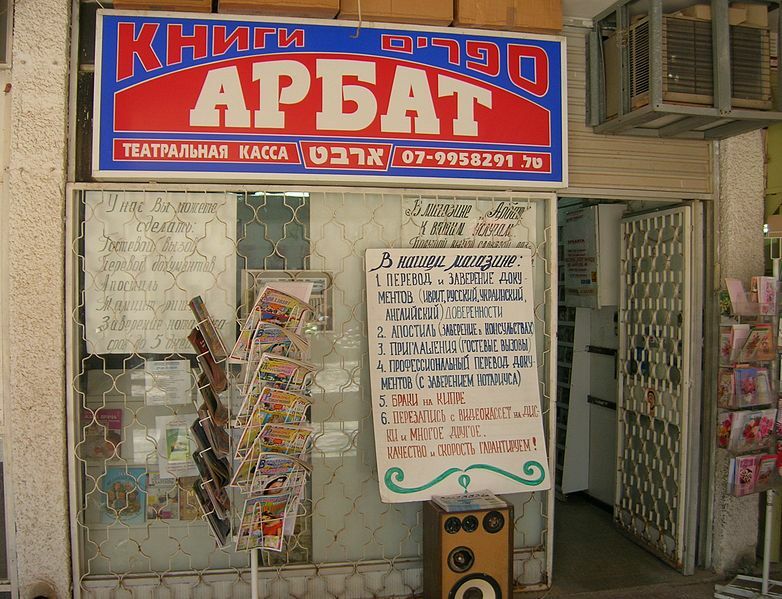 On the occupational and economic side many immigrants came to rely on so called local co-ethnic networks, which by now entail thousands of small businesses run by Russian speaking Jews, including food and book stores, restaurants, bars, small trades in building and reconstruction, car maintenance, real estate, medical and personal services, and consulting. Due to the fact that many of the Jews constituted an essential part of the local "intelligentsia" of the Soviet Union, including writers, poets, journalists, theatre and film directors and other artists, the communities soon established their own Russian speaking cultural institutions in Israel. They founded Russian speaking theatres, such as the successful bilingual Gesher theatre in Jaffa, Russian orchestras, set up Russian libraries, which also commonly function as cultural centres, and which are regularly visited by popular Russian musicians and bands, theatre companies and other artists. Russian speaking media similarly started flourishing and by now there are eleven weeklies, five monthlies and over fifty local newspapers published in Russian in Israel. In addition there are several regular programmes on radio and TV, and five TV channels directly transmitting from Russia. 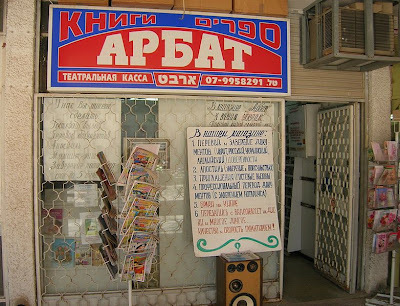 It is therefore not surprising that those living in areas with a large percentage of Russian speakers often do not even see the necessity to improve their Hebrew as most of their needs are met within this strong and multi-faceted subculture. Liebrman's Yisrael Beyteinu: "No Loyalty, No Citizenship"
In order to also be represented on the government level, the first "Russian immigrant party" Yisrael BaAliyah (a double meaning for "Israel on the Up", or "Israel through Immigration") was established in 1996 and already in the same year won 5,7% of the votes which translated into 7 seats in the Knesset, making it the sixth largest party. 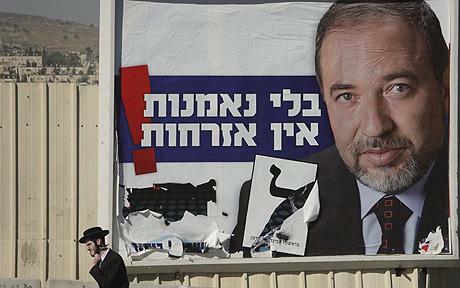 In 1999 former Likud member Avigdor Lieberman founded another party with the goal of constituting a platform for Russian immigrants. As opposed to Yisrael BaAliyah, the new party Yisrael Beiteinu ("Israel our Home") is based on an explicit right wing nationalist agenda, and contributed to the above mentioned generalised association of Russian speaking Jews with a hard line approach to negotiations with the Palestinian Authority. It should be emphasised here that the party's political stance by no means only appeals to (some of) the Russian speaking communities, but attracts instead a large array of hardliners from different backgrounds. In the 2009 elections the party won 15 seats, making it the third largest party in the previous Knesset, and facilitated Lieberman's ascent to the post of Foreign Minister. The development of the strong Russian speaking subculture in Israel is by no means unique or surprising. Instead it emphasises once more the impossibility of the coming true of the Zionist dream of creating a homogeneous Jewish society. It is indeed sad to see that, rather than celebrating Israel's cultural heterogeneity and appreciating the manifold contributions of the Russian speaking communities to an increasingly multi-cultural society, many Israelis still insist on the realisation of the melting pot theory and charge those who are “not Israeli enough” with non-compliance.